It’s only been a few hours since I got home from the midnight screening of Captain America: The Winter Soldier so I thought I would review it while it’s very fresh in my mind. I’ll avoid spoiling the main plot points and twists but the odd mini spoiler may creep in – consider yourself duly warned. The film picks up some time after the events of The Avengers (or Avengers Assemble if you happen to be in the UK) and Steve Rogers (Chris Evans) is working for the spy organisation S.H.I.E.L.D. He’s doing a good job acclimating to the modern world and thankfully hasn’t lost his wide eyed enthusiasm or his unflinching optimism which I appreciated, it would have been too easy to make Captain America a morbid and brooding character in the wake of his decades long deep freeze so I’m glad they took the harder route and went the other way here. The things that makes Cap so appealing to me as a character are his black and white morality as well as his optimistic outlook. He’s a man who takes everything that’s thrown at him and moves on, trying to make the world and other people better as he goes. Unlike his fellow Avengers Cap has nowhere to go except from S.H.I.E.L.D, everyone he ever knew is either dead or very old and the world is a very strange place to him so it makes sense that he would join S.H.I.E.L.D as it allows him to protect people with nigh on unlimited resources to help him do so. Very early on in the film Cap expresses his annoyance with the missions he’s being sent on, saying that he’s tired of being “Fury’s Janitor” but he gets on with it anyway since he’s a soldier. In that same mission he finds out that Samuel L. Jackson’s Nick Fury has given Scarlett Johansson’s Black Widow an additional objective that Cap was never informed of and he wastes no time in confronting Fury about it. From then on the film rockets along at a frenetic pace as Cap begins a campaign against the increasingly corrupt S.H.I.E.L.D. He doesn’t have to do it alone though as Black Widow and Anthony Mackie’s Sam Wilson (the costumed hero known as Falcon) join his cause. This cause is complicated by the appearance of the Winter Soldier – a historic legend that even Black Widow reveres. 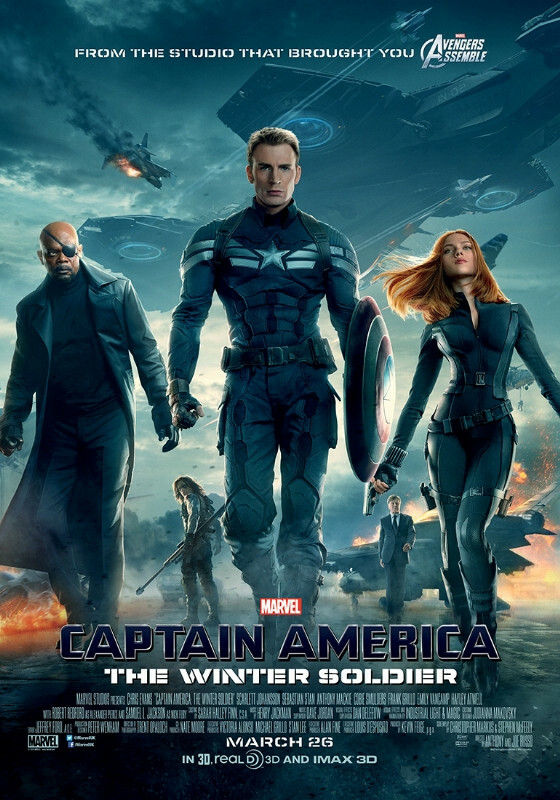 The Winter Soldier is more than a match for the trio as he gives even Cap a run for his money in hand to hand combat. Mentioning who plays the character will in itself be a spoiler (depending on your familiarity with the comics) so I won’t do that but I will say that this antagonist is a deeply personal one for Cap. The story is great, the crusade against S.H.I.E.L.D is handled wonderfully with some choice appearances by Cobie Smulders’ Maria Hill and Marvel Cinematic Universe mainstay Jasper Sitwell (Maximiliano Hernández), everyone serving their defined purpose within the story instead of appearances for appearances sake. There are a couple of interesting twists in the story when the characters learn just how deeply the corruption goes. With the scale of events being so large it’d be easy for that to overshadow everything but that doesn’t happen here. The film keeps the characters as the firm focus throughout and never forgets to develop them accordingly, the events seem more grounded as a result and this is very much a Cap story and he couldn’t be substituted for anyone else. The cast are all great. Chris Evans and Scarlett Johansson have great on-screen chemistry and their interactions are practically lifted straight from the comic books. Anthony Mackie’s Falcon is similarly fantastic, he and Evans have such natural interactions and succeed in putting across a friendship born of mutual respect. Writers Christopher Markus and Stephen McFeely really understood the characters they were writing with every single one being spot on as far as I was concerned. The main cast are all given their moments to shine within the story with nobody feeling any less important than anyone else. I really enjoyed that Black Widow’s skills as a master spy are fully on display here as well as Cap’s combat prowess and tactical thinking. Other highlights were Frank Grillo’s Brock Rumlow and Emily VanCamp’s brief appearance as Sharon Carter/Agent 13 which was mostly to set her up for a sequel. She is still afforded some good moments though. Naturally this film can’t be reviewed without mentioning Robert Redford’s turn as Alexander Pierce. The very presence of Redford adds a sense of legitimacy to everything, right off the bat we can see that he’s a nonchalantly important man who is very set in his beliefs and committed to his cause. He also plays off Chris Evans and Samuel L. Jackson very well. I’ve raved about how great this all is so I should talk about things that didn’t work for me. There was very little that I didn’t like about this film. I would say that the shaky cam in the action scenes was a little distracting but I’ve seen it done far worse in other places. Also, I would have liked them to delve further into the Winter Soldier’s origin and generally feature more in the way of character moments from him but hey, isn’t that what sequels are for? I also can’t help but feel that there could have been a place for Jeremy Renner’s Hawkeye here given his affiliation with S.H.I.E.L.D but maybe that would have been one too many characters. It’s interesting to note that through this story we get the Superman story that should have been. It’s well documented that Captain America and Superman have pretty much the same values. It is in this film that those values are front and center. It’s well established what Cap believes in and everything he does here is informed by those beliefs, there’s even a few moments where he says a few corny lines that coming from anyone else wouldn’t fit. This film is proof that you don’t have to make your characters dark to make them interesting, Captain America is represented here in the exact way he should and it 100% works, hopefully other filmmakers will bear that in mind when adapting other characters. I loved this film from start to finish. Captain America is my favourite Avenger and this is pretty much everything I want and expect from a story featuring that character. It’s so refreshing to come out of a film feeling like I had such a great time, I’m holding myself back from rating this as among the best solo outing comic book outings. Once I’ve seen it a few more times I’ll have some perspective on where it fits but for now I stand by my rating. A very good review. Makes me even more excited to see the movie. I’m excited to see it again, really great stuff. Even though I really enjoyed the film I think I was surprised to see such a strong SHIELD theme; it really felt like a SHIELD film wherein Cap was the main protagonist rather than a Cap film. I don’t want to say that made it bad but I was surprised. Is it the first of the films (not including Avengers) in the set to push the overarching plot so hard? Yeah I definitely agree that it was a S.H.I.E.L.D centric movie but I kind of knew that going in. I’m glad that it managed to be so focused on Cap’s character and what makes him tick, I was half expecting him to get buried in all that S.H.I.E.L.D stuff but that didn’t happen, remarkable really. As for the other movies, I’d say Iron Man 2 and the first Thor pushed the overarching plot the most, there was a big S.H.I.E.L.D presence in each of those.